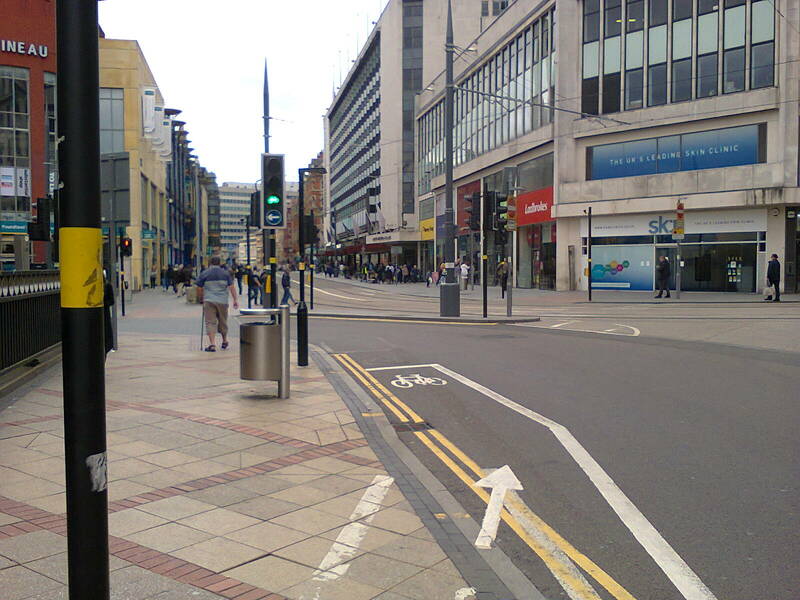 Whilst birminghamcyclist.com was still on the net, there were numerous posts complaining that it is getting harder and harder to cycle across the city centre. 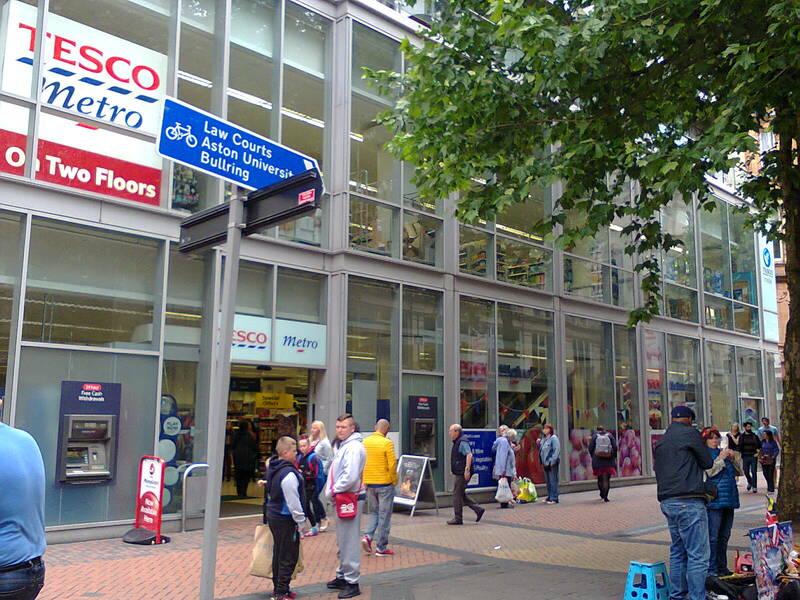 Earlier this year I emailed Liz Clements, who is chair of the transport scrutiny committee at Birmingham City Council, documenting my own experience, with particular reference to the effect of the tram. This blog post is largely the same as what I told Councillor Clements. This subject has become very topical again, as Push Bikes has learned that whilst Greater Manchester is using government money to promote cycling, from the same pot the West Midlands will be ploughing even more money into the tram. Since per passenger kilometre tram projects are vastly more expensive than even first class cycling projects, the expenditure in Manchester will be vastly more effective and useful. Even if all the published plans and pipe dreams for the West Midlands tram come to pass, it will only ever provide transport covering a tiny fraction of Birmingham. Across the West Midlands its contribution to transport will continue to be infinitesimal. 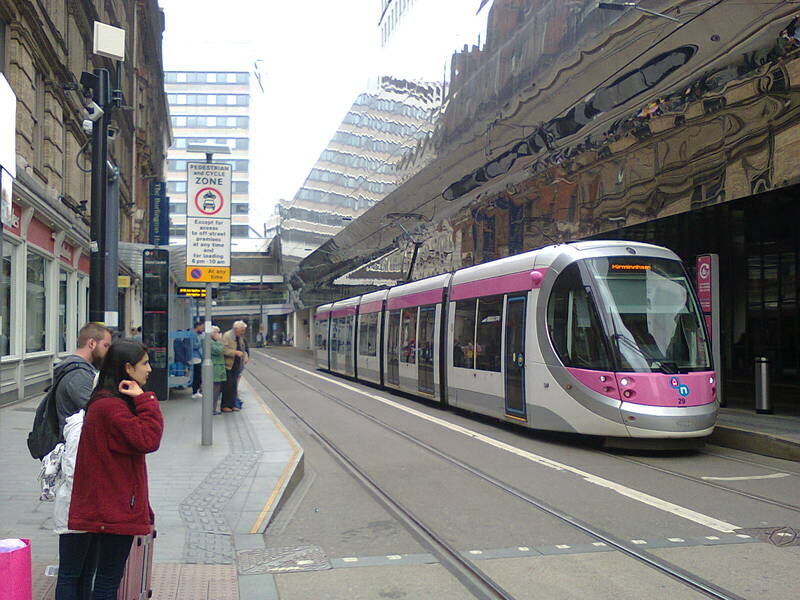 At present more journeys in the West Midlands are cycled than are undertaken using the tram, and the hundreds of millions of pounds being lavished on the tram will not change that. Personally I have never used the tram, and it is highly unlikely I will ever use it, because neither the existing lines nor the planned lines allow me to make any journey I make, or any journey I have ever made in Birmingham. The planned extensions would partially coincide with a journey I occasionally make by train, but why would I or anyone else swap a relatively convenient journey for one that is less convenient and slower? The only conceivable tram journey I can imagine myself making would be New Street to Curzon Street, if I had awkward luggage. 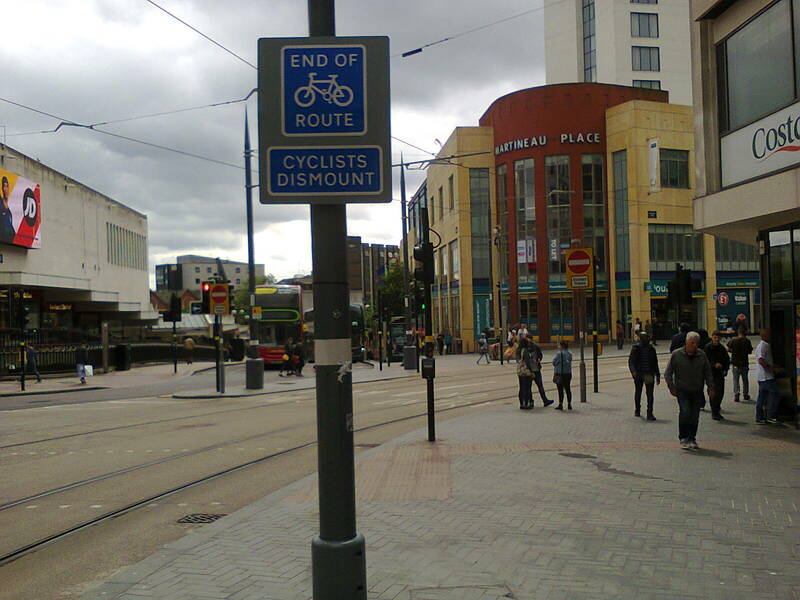 And if all that wasn't bad enough, the tram in Birmingham is an impediment to cycling, a form of transport that we know, both from experience and from the Sustrans Birmingham Bike Life report, would be used my many people if there was ubiquitous cycling infrastructure of reasonable quality. The fundamental problem with tram tracks is that cycle wheels can get trapped in them, causing the person riding the bike to be thrown to the ground. This has resulted in many injuries, and even death. This problem is exacerbated when the track is wet, because water acts as a lubricant between rubber and steel. There are two means of dealing with this. One is to use a product called VeloSTRAIL. 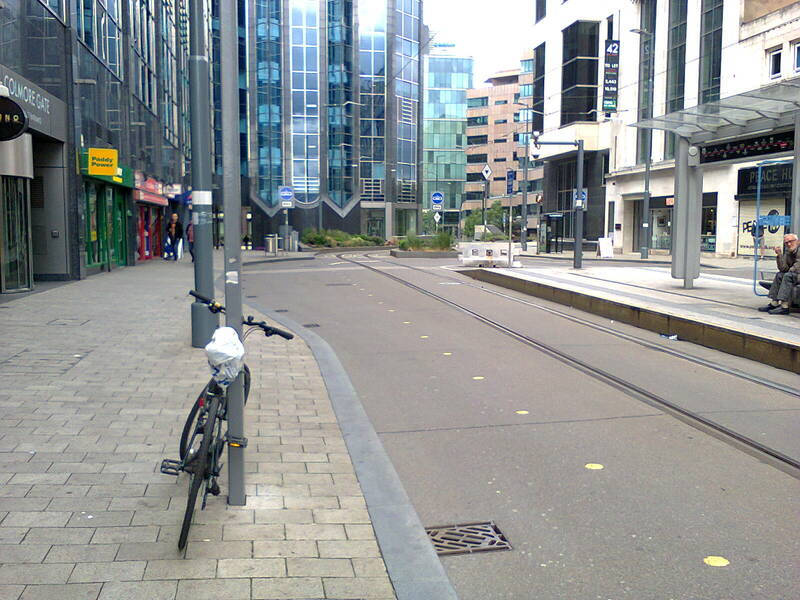 Whilst a STRAIL product has been used to facilitate a grassed section of the tram track, VeloSTRAIL has not been used anywhere in Birmingham. 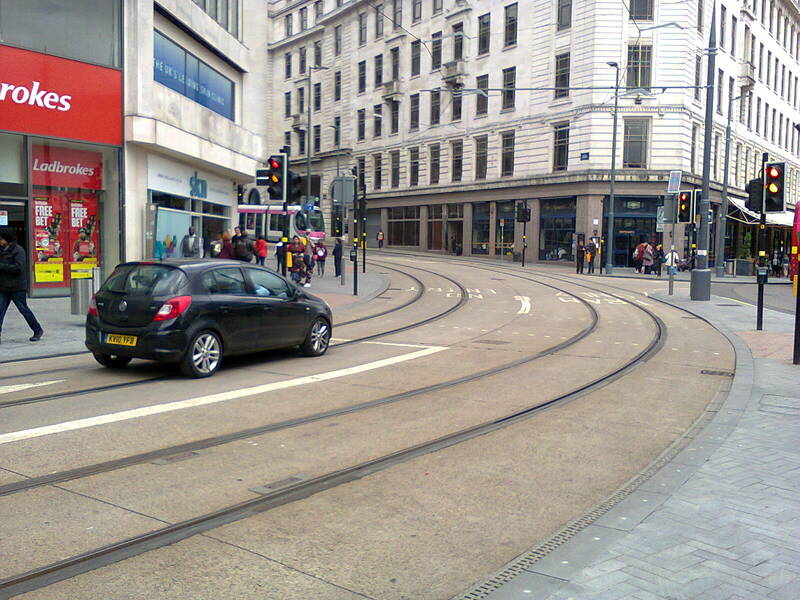 The other approach is to design cycle routes so they cross tram tracks at around ninety degrees, but Birmingham has only made one attempt at this. Let us consider the effect of the tram on just one, signed cycle route (one I need to use to get to the Birmingham Cycle Revolution stakeholder meetings). 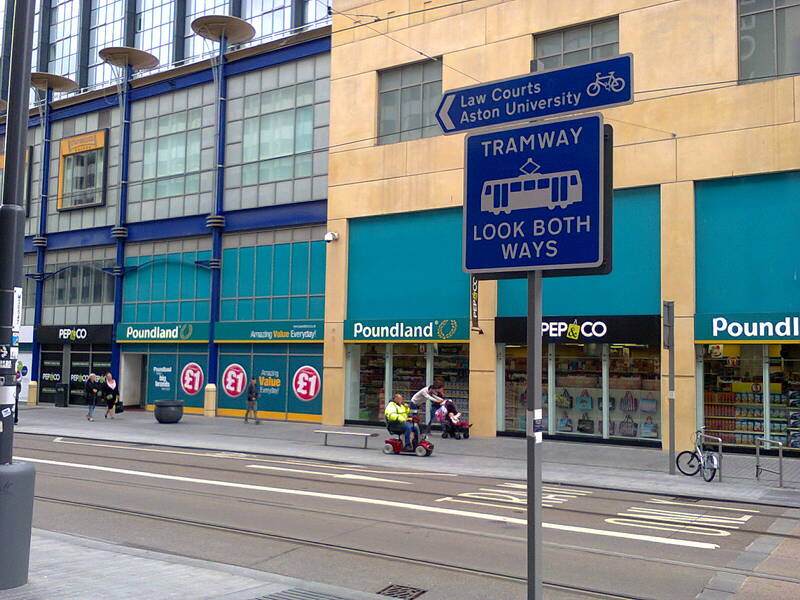 It is a route I have used for years, but signage erected for the tram now makes it illegal to cycle it. Keep in mind that what I am describing here has been built in the last few years. I come into the city centre on the Worcester and Birmingham Canal, and head for Navigation Street. 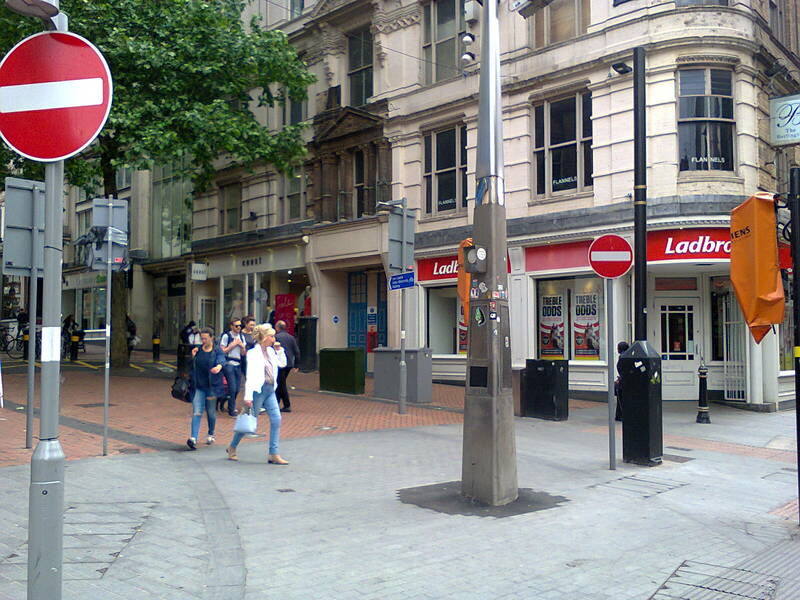 At the end of Navigation Street cyclists are directed off the carriageway and told to dismount, whilst car drivers are allowed to continue. Note the NO CYCLING sign; that makes it illegal to cycle across Stevenson Street here, even though it is perfectly safe to do so. Note also that the road here has been made one-way with no cycling contraflow. The alternative return route, via Pinfold Street, is being cut off by the tram extension. Bizarrely, one is allowed to cycle past the entrance to New Street station, even though that means cycling along the tram tracks. This is inadvisable, as a change in direction will take one across the tram line at a shallow angle. I know of at least one person who has been dismounted by the tram tracks whilst cycling along here. At New Street the sign advises going right. I normally go left here and head for Temple Row, for reasons that will become apparent, but let’s keep following the official route. New Street is very busy with pedestrian traffic along the length of the official cycle route, which makes cycling difficult (unlike if you turn left on to New Street). 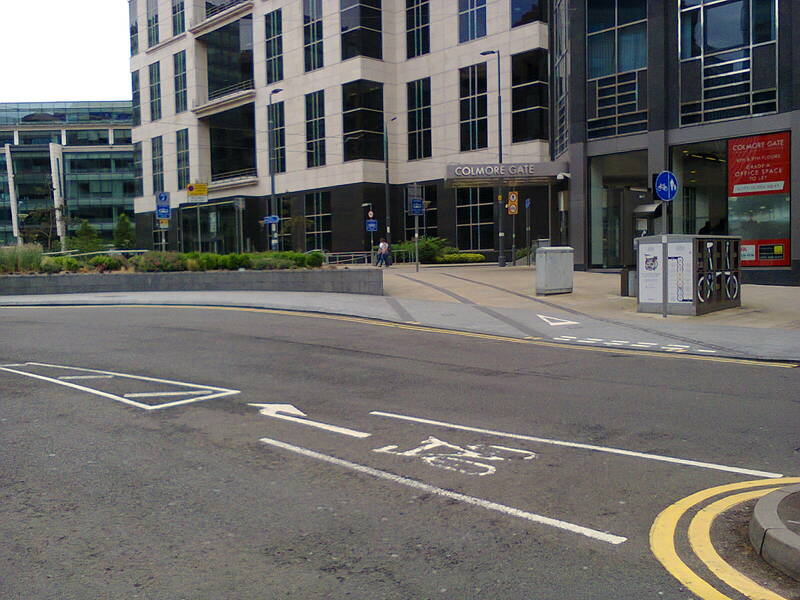 At least at the bottom of Cannon Street there is some good practice – a cycling contraflow, correctly signed. Unfortunately at the top of Cannon Street the cycle route comes to an abrupt end. 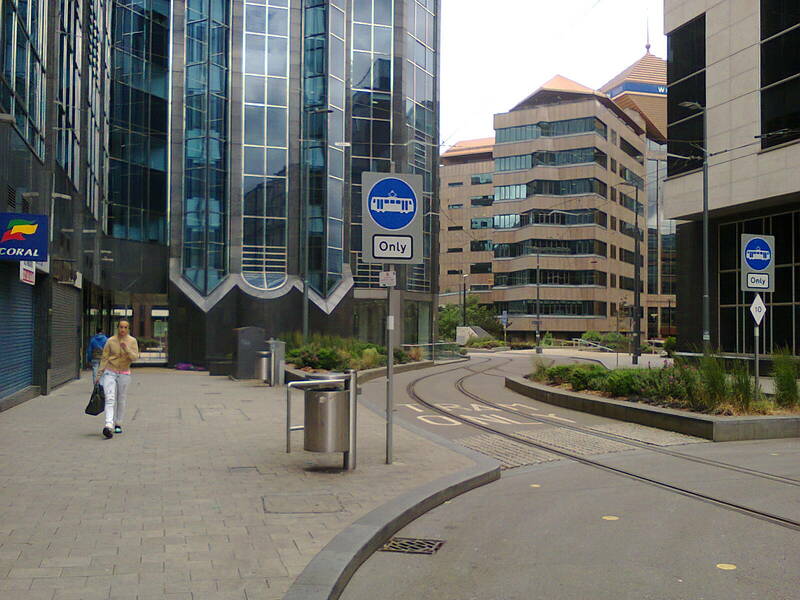 The blue sign for the law courts is there (on the left), but it’s a pedestrian only sign. For cyclists it’s END OF ROUTE – CYCLISTS DISMOUNT. 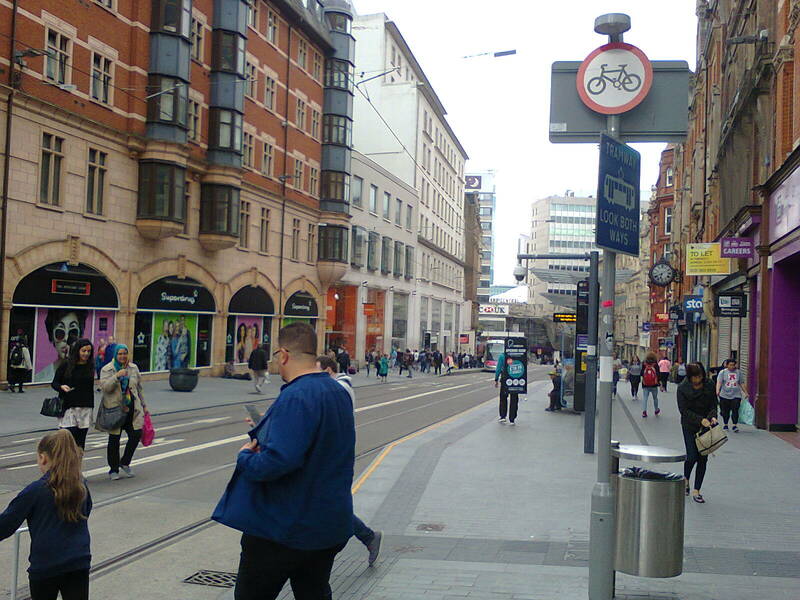 However, if one pushes one’s bike as far as Corporation Street, the cycle route reappears, but directing cyclists along the tram tracks, which is bad practice. Riding along a tram line, if a pedestrian steps in front of you causing you to swerve over the tracks, there is a high risk of being thrown from your bike. So it is sensible not to cycle along the tram route. Sure enough, cycling on the tram tracks heading South is forbidden by law. Yet both the signage in Stevenson Street and the signage at this point not only makes it legal to ride along the tram route going North, but also at this point one is actively encouraged to do so. 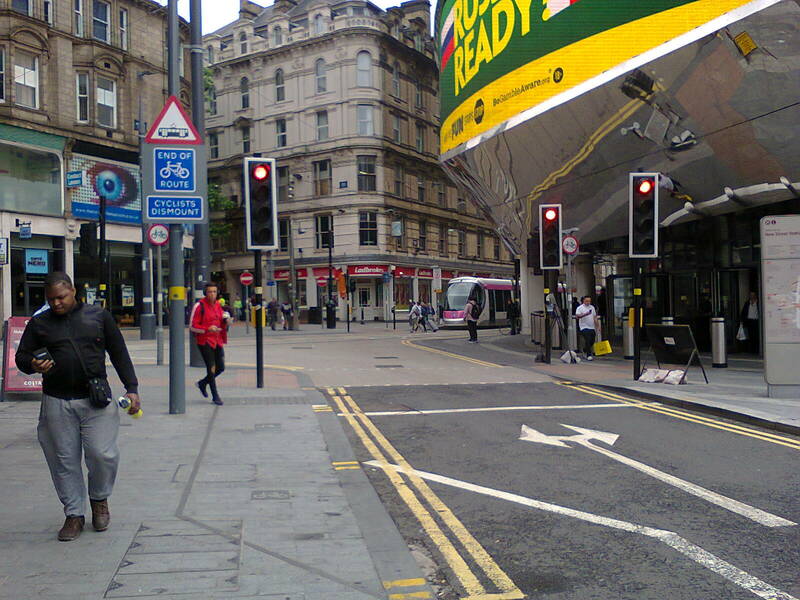 Was there sufficient space for a proper two-way cycleway on Corporation Street? Yes, of course there was. Before the tram, there were four lanes given over to motor vehicles. 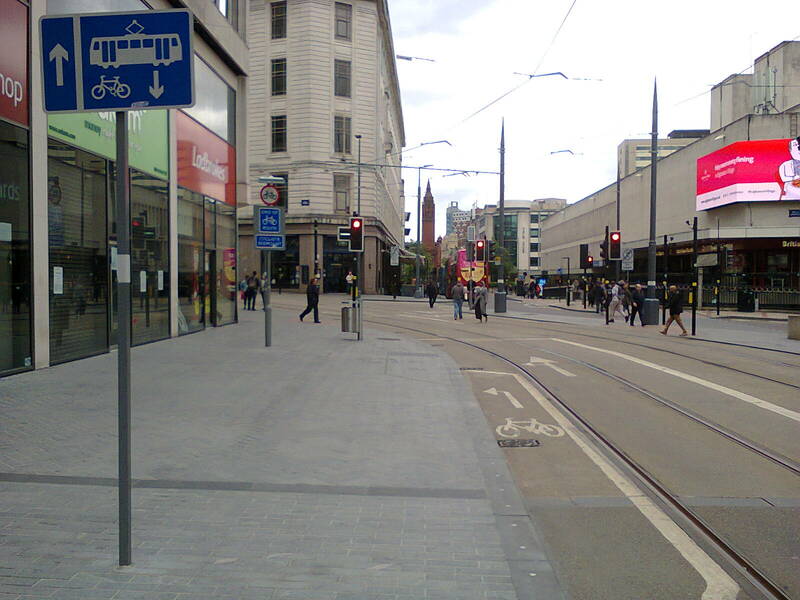 However, once we get to Bull Street, cyclists are directed off the tram lines on to the pavement and told to dismount. This is backed up with legal enforcement in the form of a NO CYCLING sign. You can see the tower on the Methodist Hall in the distance, which is the direction we are trying to go. Car drivers are not expected to push their vehicles. This driver turned right at the traffic lights and carried on down Corporation Street towards the law courts, something that cyclists are prevented from doing. Approach the same junction from Temple Row, and we can see that just around the corner from the NO CYCLING sign, one is allowed to cycle on the pavement. Note that the sign is incorrect; this sign is used to denote a split path, on which pedestrians must stay on the left, and cyclists must stay on the right (of a line that hasn’t been painted). Of course this would be the dumb way to arrange things, as it would mean people would cycle past the entrances of shops, knocking over emerging pedestrians. Cycling on the pavement weaving through groups of pedestrians like this is unpleasant for both cyclists and pedestrians, but the alternative is to dismount, which defeats the object of having a bicycle. However, back at the junction, it’s END OF ROUTE – CYCLISTS DISMOUNT, and no signage telling one where to go next. Now this would be a good point to go across the tram lines at 90 degrees and head down Corporation Street, but cycling across the road here is discouraged and, if heading from Corporation Street on the official route, illegal. However, it is the most direct route to the law courts from this point. But it’s a moot point, as the official cycle route to the law courts ends here. Let us now consider the return route. A cycle lane briefly hops on to the crowded pavement as we approach Bull Street. The paint has partly worn away, but pedestrians have always ignored it anyway. After a few metres cyclists have to stop for pedestrians waiting to cross the road, and then wait for them to cross, and then wait for the next batch of pedestrians to cross the road. You can probably see the issue here. Just after the crossing, cyclists are directed back on to the carriageway. 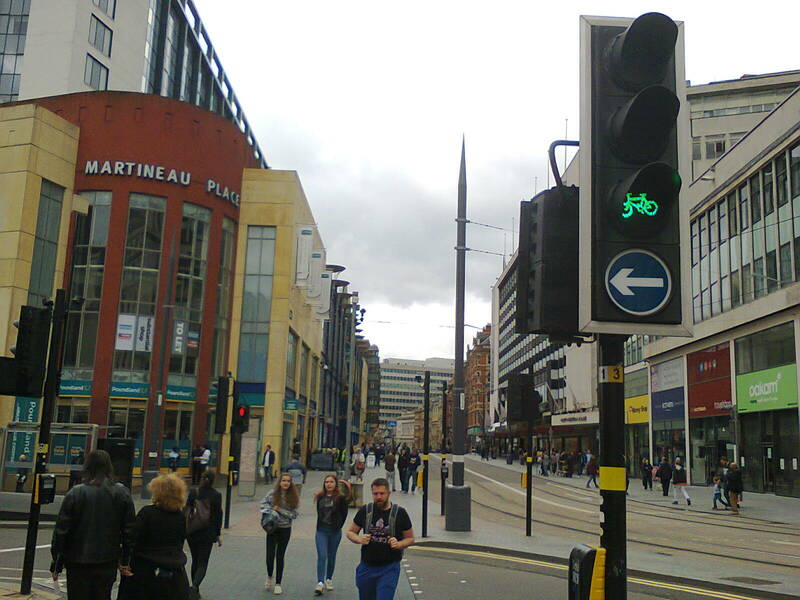 A cycle traffic light is provided, but note the white arrow on a blue background. There is no way forward here. Those pedestrians are on a pedestrian crossing, not a toucan crossing. 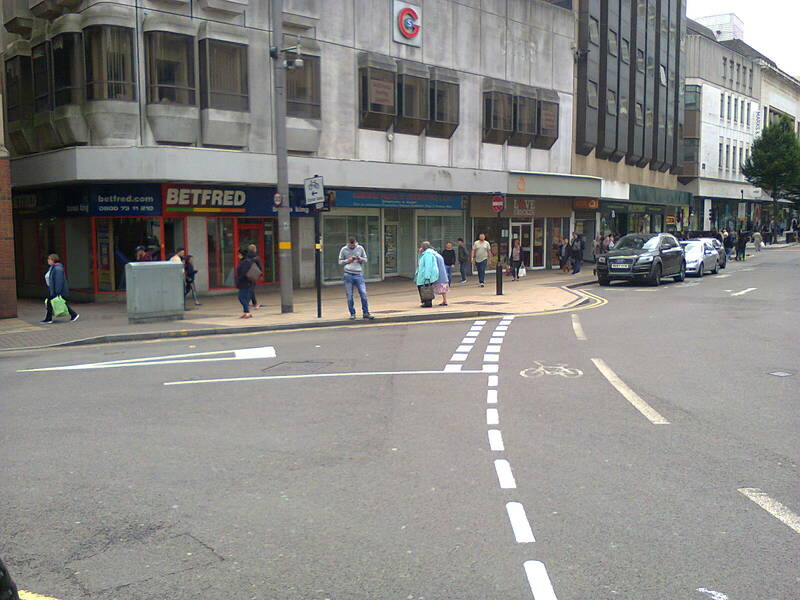 Diverting from the intended direction, going left the cycle lane takes one down to Betfred. Yes, its destination is a betting shop. Whilst theoretically one is allowed to cycle on the pavement, a narrow pavement and high levels of pedestrian traffic makes that impossible. 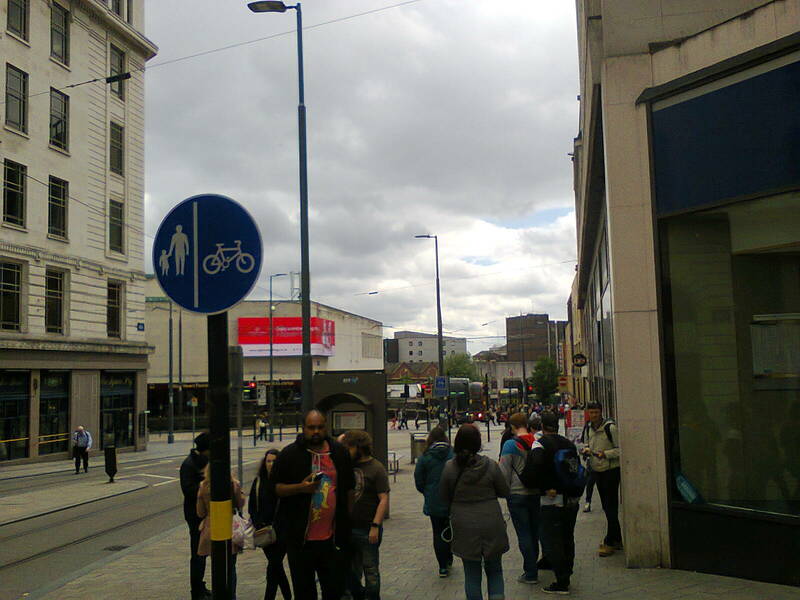 And then you would have to make up your own route through the pedestrians back to Corporation Street. 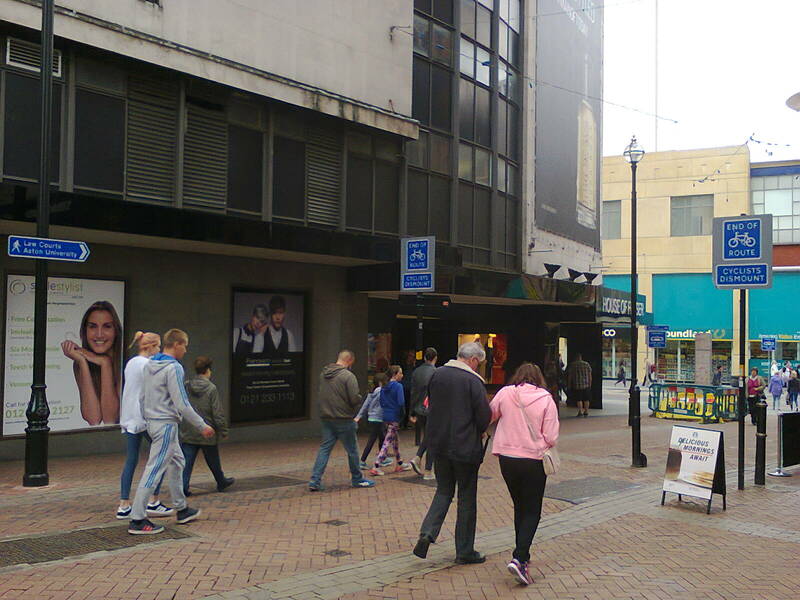 Indeed it would be easier to cycle in through the front door of Betfred and place a bet. The tram tracks are to be taken down this road too, taking the tram at massive expense the short distance to Curzon Street. A cycle route that demands you get off an push every few metres isn't a cycle route, it's a walking route. If I wanted to walk a journey I would leave my bike at home so I wouldn't have the inconvenience of pushing it. But whilst for me CYCLISTS DISMOUNT and NO CYCLING are an annoyance, if you use a cycle as a mobility aid, because, for example, walking is painful, a "cycle route" that demands you get off and do the one thing you can't is both offensive and contrary to the Equality Act. 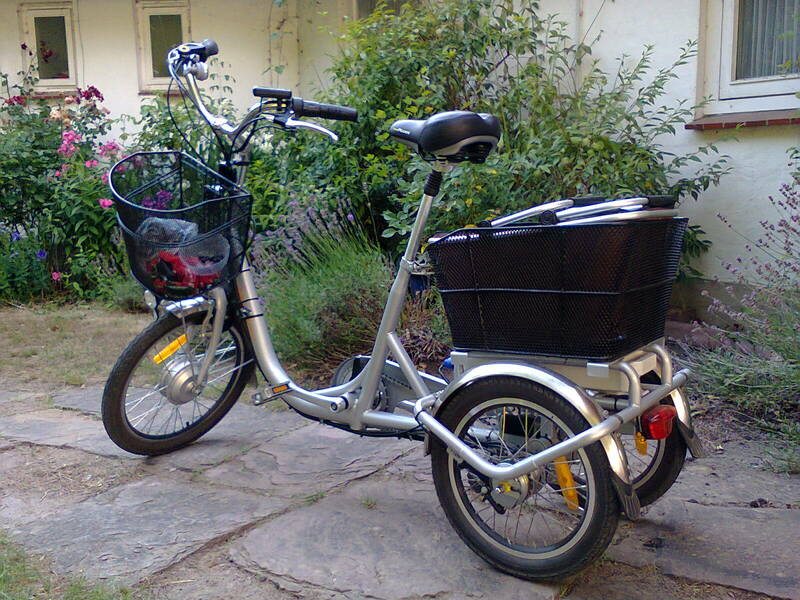 The person who uses the e-trike in this photo finds walking painful, but because she lives in a small German town, which like many German towns has usable cycling infrastructure, she can use her trike to go anywhere in town with ease, and without resorting to using a motor vehicle. That keeps her physically active, and means she isn't helping to create a traffic jam in the town centre. It also means she can go door-to-door, which is something you cannot do using public transport, and which is often impossible in a motor vehicle. This trike is quite literally next to the front door of the house you can see in the background, somewhere you cannot get to in a car. Door-to-door is essential if you have difficulty walking. 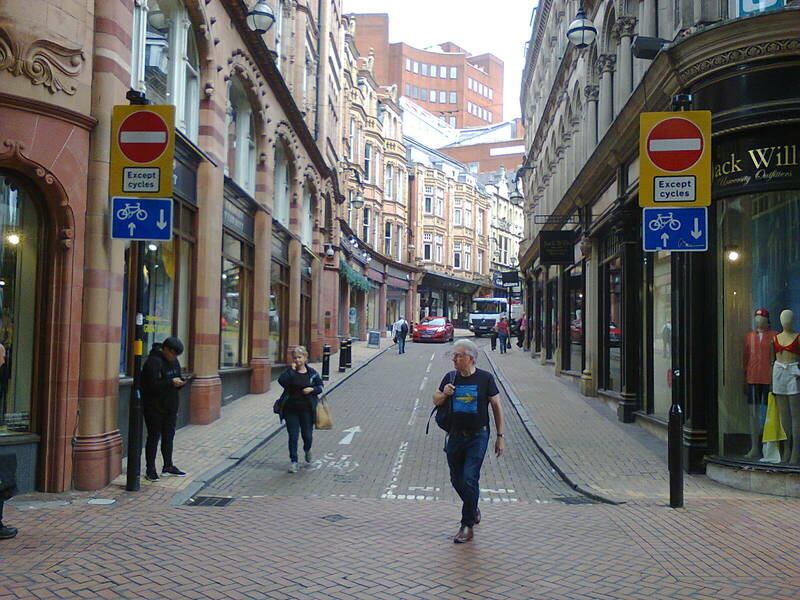 Back in Brum, but away from the signed cycle route, there’s lots of space on Bull Street, but no opportunity was taken to create cycle permeability. 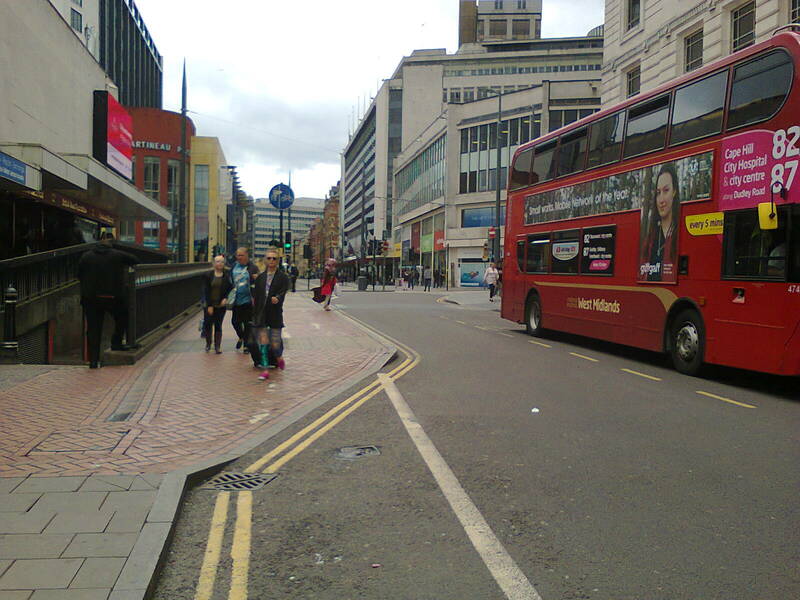 The bike is not mine; people are trying to cycle in Birmingham, and finding the infrastructure not fit for purpose. That's why they are resorting to cycling on footways, through covered shopping centres, and the wrong way along one-way streets with no cycling contraflow, and it's why they are ignoring all the CYCLISTS DISMOUNT and NO CYCLING signs the council is spending money on. Elsewhere councils spend money on enabling cycling, because it is highly cost-effective. Further along Bull Street it is completely illegal to ride a bike. Only pedestrians, animals (such as bulls), and the tram are allowed to pass this point. The irony is that at the other end of the pedestrian and tram access above, we see this rare piece of good practice, a short cycleway to facilitate crossing the tram tracks at 90 degrees. Alas its not very useful in the direction shown, as no thought has been given to how a cyclist might get here, or where they might be going. People generally don’t want to cycle along the ring road, taking a detour via Colmore Row.